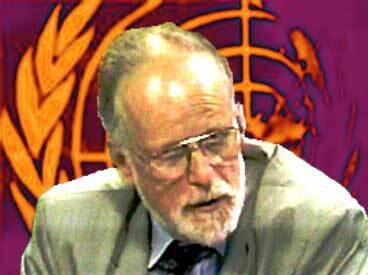 THE WIRE SERVICES announced on Friday 18th July 2003 that the body discovered on Harrowdown Hill, Abingdon, Oxfordshire may be that of Ministry of Defence scientist, a biological and chemical weapons expert, David Kelly. The identity of the body was confirmed the next day as indeed being that of Kelly, a quiet man who had been catapulted into the news only a few days earlier. He had left his home for a walk on Thursday afternoon, his family alerting the police when he had failed to return by 11:45 p.m. that evening. His body, when found on the Friday at 9:20 a.m., had a cut across his left wrist with an open pack of the prescription-only painkiller Co-proxamol lying by his side. According to the British Medical Journal these are used in 1 in 20 suicides. There was no note, no explanation. His wife has revealed that he had told her earlier that he 'didn't want to live in a world like this'. What caused him to reach a state of such despair? Saddam's military planning allows for some WMDs to be ready within 45 minutes of an order to deploy them." "It was transformed in the week before it was published to make it sexier. The classic example was the claim that weapons of mass destruction were ready for use within 45 minutes. That information was not in the original draft. It was included in the dossier against our wishes, because it wasn't reliable. Most of the things in the dossier were double-sourced, but that was single sourced, and we believe that the source was wrong." "Most people in intelligence were unhappy with the dossier because it didn't reflect the considered view they were putting forward." "I believe it is about 30% likely there was a chemical weapons programme in the six months before the war, and considerably more likely there was a biological weapons programme. We think Blix downplayed a couple of potentially interesting pieces of evidence. But the weapons programmes were quite small. Sanctions did limit the programme." Humphries, the presenter, a very interesting point. "Now the 45-minute issue is not just a detail. It did go to the heart of the government's case that Saddam was an imminent threat, and it was repeated a further three times in the body of the dossier." Gilligan was aware that at this time a parliamentary investigation had been ordered into the claims made by the British government about Iraq, and he suggested that it was exactly this element of the dossier that should be thoroughly investigated. Downing Street had been feeling beleaguered by the BBC since the beginning of the Iraq war. The Corporation had been tagged the 'Baghdad Broadcasting Corporation' for its stance on the war, reflected in its news coverage of events. It is by no means the first time that the BBC has come under fire from the government of the day for its lack of patriotism. Indeed, during the Falklands conflict, the BBC refused to use the term 'Task Force' when referring to the British army, preferring 'British Forces', a reporting stance that infuriated then Prime Minister Margaret Thatcher. This approach to news journalism is deep-rooted in the culture of the BBC, and it remains whilst governments come and go. However, Gilligan's assertions provided the opportunity for the government to take the BBC to task. Thus a bitter feud began. June 1st -- Gilligan writes a more detailed account of the issue in the Mail on Sunday. It was in this that Alastair Campbell was named as the man who 'sexed up' the dossier. June 2nd -- Susan Watts, BBC Newsnight science correspondent reports on a conversation she has had with a 'senior official' intimately involved with the process of compiling the September dossier and that he claimed "the intelligence services had come under heavy political pressure to include the '45 minutes' evidence." June 3rd -- The Leader of the House of Commons claims the information is the work of 'rogue elements' in the security services. June 6th -- The Prime Minister's office makes a statement saying there were a "series of inaccuracies in Gilligan's report." June 19th -- Gilligan testifies to the Foreign Affairs Select Committee investigating the decision to go to war with Iraq. He again describes his source as "easily sufficiently senior and credible to be worth reporting." " I know we are right in relation to that 45 minute point. It is completely and totally untrue. It is actually a lie. Until we get an apology for it I will keep making sure that parliament and people like yourselves know it was a lie." However, the Committee found that the government had been unwise to use the '45 minute point' although Campbell was exonerated from altering the document. The BBC meanwhile refused to apologise. "We stand by our entire story. The BBC will respond properly to these matters but not to a deadline dictated b Mr Campbell." June 30th -- Dr Kelly informs his line manager that he had met with Gilligan earlier in May. He did this because a colleague told him that some of Gilligan's quotes sound 'remarkably like your turn of phrase'. July 3rd -- Geoffrey Hoon, Minister for Defence learns that Kelly has admitted he has met with Gilligan at least once in the last six months. July 4th - 7th -- Dr Kelly is interviewed for three days by the MoD personnel. As Gaby Hinsliffe wrote in The Observer (20/07/03) "Was Kelly threatened or coerced by the MoD during three days of interrogation?" She is one of the few journalists who have asked this question. July 6th -- The BBC governors meet and issue a statement defending Gilligan and calling on Campbell to withdraw his allegations of bias against the BBC. At the same time they point out that Downing St. has not commented on the Newsnight programme which broadcast similar statements.
" We conclude that the 45 minutes claim did not warrant the prominence given to it. We recommend that the Government explain why the claim was given such prominence." "We recommend that Andrew Gilligan's contacts be thoroughly investigated." "We conclude that Ministers did not mislead Parliament." July 8th -- 10.15am. Greg Dyke, Director General of the BBC says there will be no apology and that Alastair Campbell should bury the hatchet. July 8th -- 5.5pm. The government announces a staff member has admitted meeting Gilligan. The statement says that they do not know if this man is Gilligan's source, but if he is then Gilligan has exaggerated the content of their discussion. The statement also says that no comment was made about Mr Campbell. July 9th -- Geoffrey Hoon, Minister of defence writes to the BBC asking them to confirm or deny the source was David Kelly. The BBC refuses saying this has "descended into a farce." At this point Kelly's name had not been made public. It is highly unusual for civil servant's names to be revealed and Kelly rightly thought at this point he would remain anonymous and the incident be dealt with internally. However, the Ministry of Defence Press Office told journalists that day that any names they put forward as the source would be confirmed or denied. This move was allegedly approved by Geoffrey Hoon, although some sources say he opposed it but was overruled by Downing St. The Guardian later reported that it gave three names to the Press Office, and that Kelly's was one of them, and that his was confirmed. Another paper said that it used the stream of details issued by both the MoD and Downing St. about the identity of the source, put them in an internet search engine and came up with Kelly's name. It is now clear that little was done to protect his identity. By 11.40pm that evening he had been named on the Press Association's newswire. Between then and July 15th, Kelly was taken to a Ministry of Defence 'safe house', which he was very unhappy about, as he was prevented from seeing his family. He also could not have any contact with the media. It is unknown as yet what happened in those days, but it appears to have been a factor in the destabilisation of Dr Kelly. July 15th -- Dr Kelly testifies in a televised session of the Foreign Affairs Committee, where he says that he does not think he could have been the main source of Gilligan's report. The Committee are aggressive in their questioning and Dr Kelly is visibly and audibly shaken. However, the Committee back up his assertion he could not have been the main source, and tell him they believe he has become a 'fall guy' for the government. July 16th -- Blair demands that the BBC name their source after Iain Duncan-Smith, Leader of the Opposition, accuses Blair and Campbell of creating a "culture of deceit." The BBC refuses to answer the Prime Minister. July 17th -- The Foreign Affairs Committee recalls Andrew Gilligan to testify again, and brands him an "unsatisfactory witness." His testimony however has been withheld until the conclusion of the judicial inquiry into the David Kelly affair. At 3pm that day, David Kelly leaves his house for a walk and never returns. July 20th -- The BBC releases a statement after consultation with Dr Kelly's family, stating that he was the source of both Gilligan's and Watt's reports. 1. Was Dr Kelly reported accurately? The BBC has tapes of the interviews Andrew Gilligan and Susan Watts had with Kelly, and notes from a third journalist, Gavin Hewitt (former BBC Whitehouse correspondent) who also spoke with Kelly, although Kelly had denied this. 2. Did the BBC misrepresent the nature of its source? The BBC has acknowledged it was wrong to call Kelly 'a senior intelligence source'. Kelly did not work in the intelligence service, however, he did have more access than many to their information both formally and informally. However, Gilligan did not refer to him as such in his report, he simply called him a 'British official' which is correct. 3. Why did Dr Kelly's name emerge? The treatment of Dr Kelly in this respect is likely to cause the government the most damage. There is widespread feeling that the matter should have been handled internally by the MoD, and the dispute with the BBC laid to rest without his name ever emerging. However, it is clear that the MoD and Downing St, had reasons for exposing him. It is clear that many journalists are baffled by the manner in which it was handled, the drip-drip of information that lead many of them to Kelly's name before it appeared on the Press Association wire. There is also the question of who authorised it; Hoon, Campbell or Blair. There is no agreement on that at the moment. 4. What was Dr Kelly's role in compiling the Iraq dossier of September 2002? "Dr Kelly was inextricably involved in analysis of secret intelligence on Iraq and wrote more than the historical account of Iraqi weapons as claimed." It seems rather hard to believe that Kelly, who had been working in Iraq with Hans Blix, wouldn't have access to a great deal of intelligence information as his bosses would like to claim. As an expert, he would surely be central to assessing the risk from the Iraqi regime, and the question of whether a WMD could be deployed by them in 45 minutes would be one for him to answer. The reason for that turnaround being Dr Kelly's death. If there is any gain to be had from this story it is that the British public have finally become more aware of the terrible reality of spin; that there is no longer such a thing as 'the facts'. There is only a weaving of facts into a web of advantage for whoever needs it. In this case, as in that with the September dossier, the intelligence services were usurped and their information spun until they had almost become an irrelevance. George Tenet, of course, committed professional suicide with his decision to take the blame for the misrepresentation of the Iraqi's buying 'yellow cake' in Niger. Dr Kelly committed suicide 'apparently'. It is noticeable that some papers and newswires have started using the word 'apparently' over the last few days, when reporting Dr Kelly's death. In a culture of spin, any fact only is 'apparently'. Perhaps we can trust that the Sun will rise tomorrow. That is apparently a fact you can be sure of . Dr Kelly was sure that the Iraqi regime was being portrayed as more of a threat than it was. He was also burdened with the knowledge, as are we all, that people, Americans, British, Iraqis, were losing their lives because of lies. His own life was one of them.